Directions: Take the 7 train to Mets Stadium – Willets Point. Walk into the parking lot towards the stadium. You’ll reach a 4-way traffic light and continue underneath the highway underpass to reach the Marina. OC'ing is one of the fastest way to enhancing your dragonboat paddling skills. Lucky for us, our sister club World's Fair Marina Canoe Club provides paddlers with a unique training opportunity. You can paddle on an OC-2 and get one-on-one coaching instruction, or go solo and paddle on on OC-1. OC paddling slots are posted on the WFMCC Facebook page. Workouts are held at John Bowne High School in Flushing. Practices are on Sundays from 3-6PM inside the volleyball gym. Join in for a fun team workout that includes cardio, HIIT interval training, Crossfit, plyometrics, and ERG rowing machine. The ERG Rowing machine is a modified Concept 2 Rowing machine with a dragonboat paddle attachment. It helps develop cardiovascular strength and paddling endurance during the off-season. 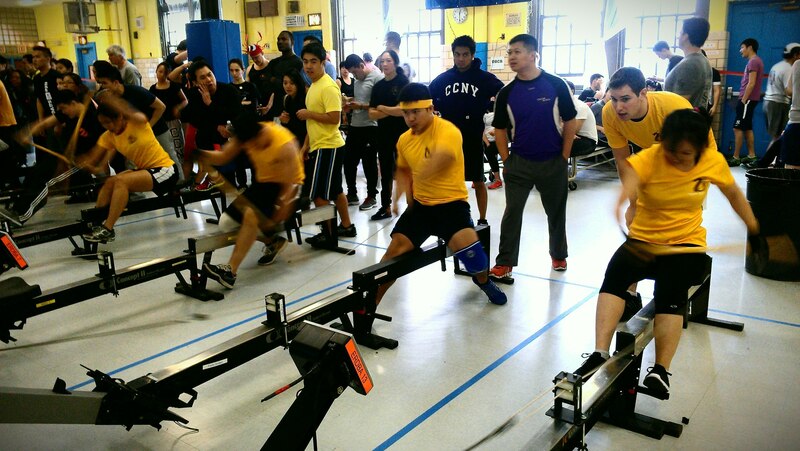 We also compete in the annual ERDBA Indoor ERG Regatta in New York City.